As I was digging around on my computer the other day trying to find miscellaneous pics for future cragbaby posts, I realized that I literally have thousands upon thousands of photos and video clips from various trips we’ve been on over the years. I’ve decided to add an experimental category of posts to my blog – Sentimental Snapshots. Once or twice a week (but don’t hold me to it…), I’ll post either a photo or a video from “back in the day”. Some might represent a special memory, an important milestone, or maybe just a beautiful outdoor setting – but all will tell a story that words alone can’t quite capture. In addition to the picture, I’ll add a little background about what makes the photo/video special to me, along with a thought or question to get you reflecting on your own journey… My goal for Sentimental Snapshots is to maybe get a good discussion going amongst readers, as well as showing the spectacular yet simple beauty that can be found when you’re not afraid to get out and explore Creation! 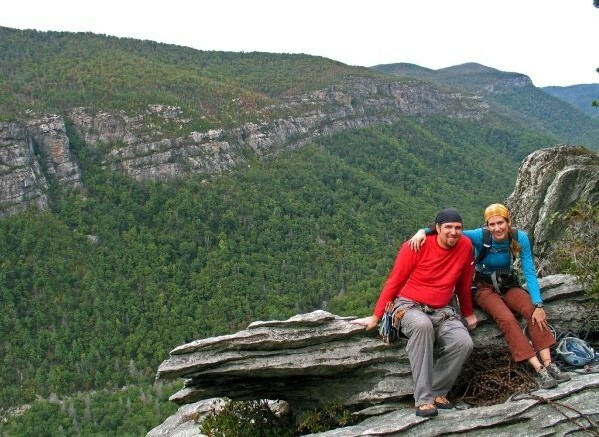 My first sentimental snapshot was taken in October of 2009, on the summit of “The Daddy,” a 5 pitch traditional route deep in the heart of the Linville Gorge in western North Carolina. I was 14 weeks pregnant, and we were eagerly anticipating Cragbaby’s arrival! When I reflect back on this picture, I think of teamwork and family. It reminds me of how many blessings my family has been given, especially now that we have expanded from two to three! I also got really excited imagining what a fun day it will be to take the same picture from the same spot in a few years – but next time with Cragbaby (who won’t be a baby anymore!) in between us! What about you – what activities do you (or did you, if you’ve already done it) look forward to participating in as a family? WOW! What a GREAT view! Enjoy that Cragbaby while he’s little, because he’ll be climbing with you before you know it! I don’t have any children right now but one thing that I think would be awesome to share with kids is backcountry camping and hiking. I didn’t get the chance to experience that growing up so it’s something I would do with my own kids.